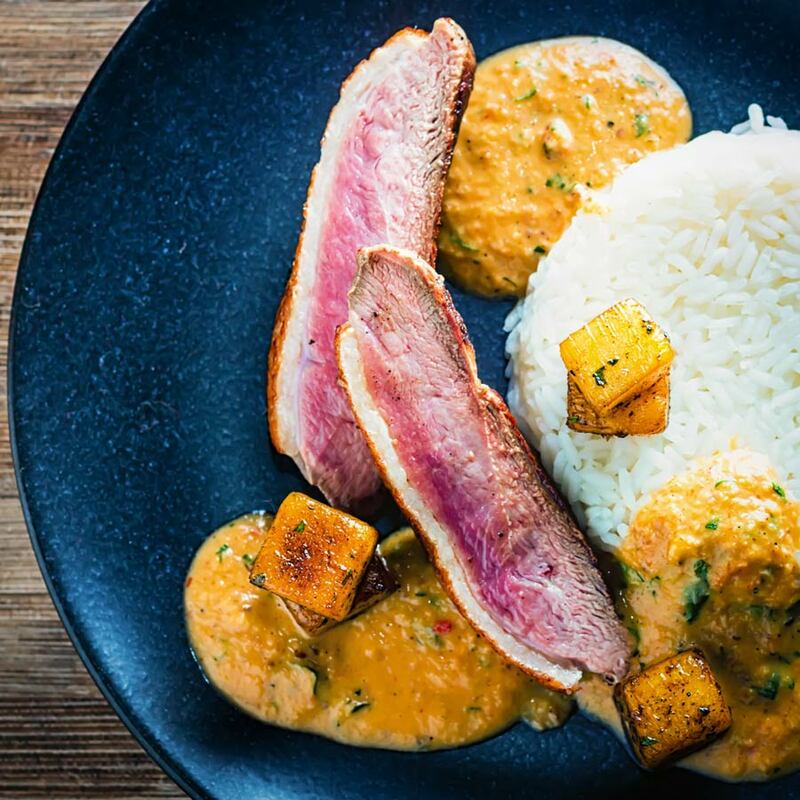 This delicious and simple slightly deconstructed Thai duck curry is full of the taste of Thai food and sweetened with pineapple. Thai Duck Curry with Pineapple. I love this time of year, my food gets much more adventurous due to having a little more free time. My over-whelming desire to treat myself takes over and this Red Thai Duck Curry with Pineapple is just one of the results. It may sound difficult and look impressive but this dish is incredibly simple to make. If you are planning a dinner party you can rustle this up really quickly. I’m talking a shade over 30 minutes! Most importantly most of the prep can be done in advance. All you need to do is cook the duck and when you are ready to serve. Amaze your guests with something that looks wonderful, tastes great. Breaking this curry into its constituent parts really helps with the eating too. Allowing you to take little bits of the sweetness of the pineapple with some of the hot sauce. It also means I get to cook the duck just as I like it rather than having to cook it well done! 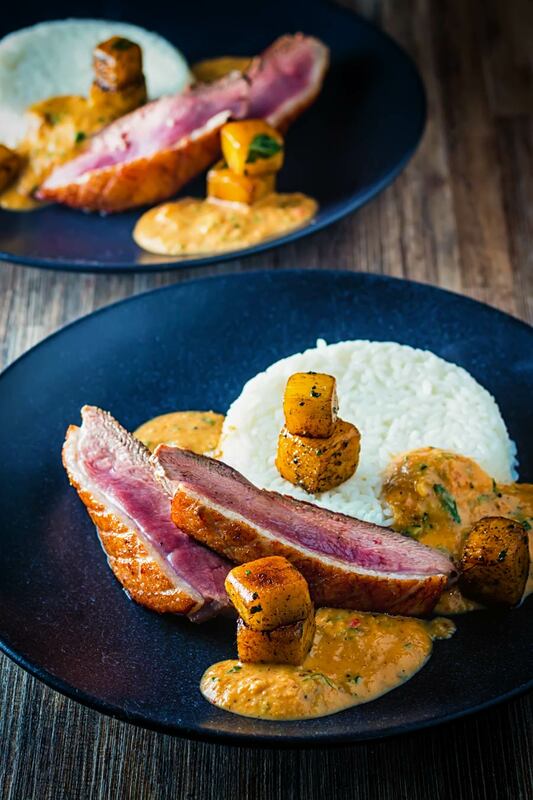 Naturally, they will need to like spice though, this Thai Duck Curry recipe is HOT stuff! I often bang on about my love of the sweet, salty, sour and hot flavour combination and Thai food does it so well. This duck curry recipe naturally embraces that in much the same way my Thai Beef Salad and Thai Chicken Stir Fry recipe does. You will notice I have called for Thai Red Curry Paste in this duck curry recipe. You can of course use your favourite shop bought variety but I always make my own. Every trip I make to Budapest involves a trip to my favourite Asian store and ingredients for Thai Curry pastes are on the list. In the main, it is a combination of rehydrated dried red chili, lemongrass, garlic and ginger or galangal. Ginger and galangal are not the same thing, they do have very different flavours. Galangal is a much more authentic ingredient for this recipe. However, they can be used interchangeably and your curry paste recipe will not be ruined. Don’t worry if you do not use curry paste often, it freezes fabulously! I put the paste into silicon ice cube trays and when frozen solid I just pop them out of the tray and place in a bag. Then whenever the need for a Thai flavoured dish arises like this Thai Chicken salad for instance, I am ready to go! I am usually one of those people who scoff at the use of pineapple in savoury dishes. In fact, I firmly believe that a ‘Hawaii Pizza’ is a food crime that should be locked away in a cell and the key thrown away. Which is odd really as I have no issue in general with fruit in savoury dishes. In fact, it is something in general that I love! Whether it be pickled peaches in a ham and cheese salad or pears with pork chops, it is really my thing! However in this Thai duck curry recipe pineapple seems to be the perfect addition. The sweetness next to the fiercely hot sauce and the creamy nature of the coconut milk all match beautifully! Please make sure you use fresh pineapple though even the tinned stuff in natural juices is too sweet! One final note, as you can see I like my duck very pink. But, I have added some notes as to the internal cooking temperatures to serve your duck as you like. If I can offer one word of advice as a cook, then buy a meat thermometer! Seriously mine is as much a fundamental part of my kitchen as my fridge, cooker or knife! They are not expensive, mine cost the equivalent of about 5 bucks and I would not be without it! 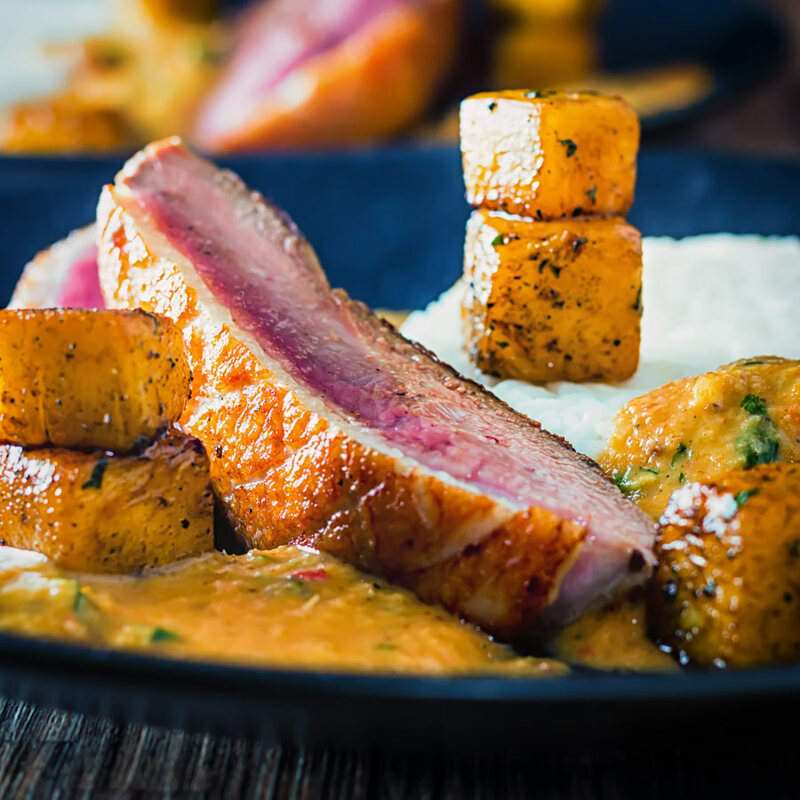 This delicious and simple slightly deconstructed duck curry is full of the taste of Thai food and sweetened with pineapple. Fry off the curry paste in a frying pan for 1 minute until it becomes fragrant. Add in the Coconut milk and stir and add in 100g of the fresh pineapple and cook for 5 minutes on a low heat. 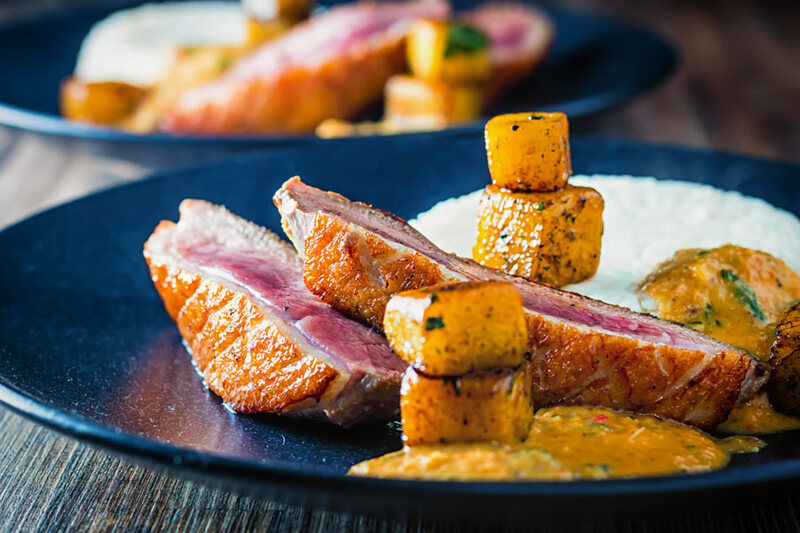 Blitz this sauce in a blender and set aside whilst you cook your duck. Heat a dry sauce pan over a high heat and when hot place in your duck skin side down after you have seasoned with salt and pepper. Add the remaining 100g of pineapple around the duck. It is important that you do not mess with the duck too much whilst it is cooking on the skin side but ensure you occasionally turn the pineapple cubes to prevent them from burning. When your duck skin is crisp and golden as my pictures above flip the duck and allow it to finish cooking on the flesh side. It is difficult to say how long to cook a duck breast for, we all have different tastes and duck breasts are all different sizes. I would recommend using a meat thermometer and use the guide in my notes below to ascertain how you would like your duck cooked. When your duck is cooked set aside and allow it to rest for at least 5 minutes. No finish off your sauce, bring it to a simmer and add in almost all of the basil and stir. Add a little basil to the pineapple cubes and stir and then plate. I like to serve this with some plainly boiled rice and add the sauce on the side and dot the plate with the fried pineapple cubes. Soak the chilis in cold water for 15 minutes. Toast the seeds and pepper off in a dry pan for about 1 minute and then grind in a spice grinder or pestle and mortar. Peel and roughly chop your ginger. Remove the outer leaves and coarsely chop your lemongrass. Remove the tops of the chilis then add all of the ingredients including the spice mix to a blender then blitz into a fine paste. Another great recipe from you Brian. Your such a good cook, yes we cooked duck because we loved it but I like to try this one. Thanks for sharing. Thanks Melve, you are too kind, I’m definitely a hard working cook not necessarily good… But cooking is all about practice and anyone really can cook great food given a little patience. Can’t go wrong with Thai red curry, coconut milk and pineapple! I love that flavor combo. I’ve never tried it with duck, but that looks incredible! A very special meal indeed. Thanks Michelle, duck is such a big strong meat it works wonderfully with big strong flavours! What a great recipe! Your photos are so pretty! I bet this tastes fabulous. I’ve never tried duck before. It makes me nervous because I’m one of those heathens who likes meat to be well done. Whenever I go to a restaurant and order steak well done, I get the most disgusted looks from the wait staff. 🙂 So, my question to you then is, if I decide to prepare duck, can I cook it all the way through? Or will that just ruin the whole thing? You see, I cannot eat “pink” meat. It’s your food dude, you should definitely cook it the way you like it… Just because I may find something over cooked doesn’t mean that everyone will, in fact one of the joys of this recipe is that it is pretty simple to prepare the meat in many different ways, I have to do this as my wife likes medium rare and I am rare all the way, cooking in sauce makes that a tough job. I would definitely advise any one to get a meat thermometer to ascertain to what level a piece of meat is cooked, it is possible to remove all pinkness from duck lamb or beef and still end up with a bit of moisture, but it is a very fine line between that and charcoal and a meat thermometer is perfect for nailing that. Loads of people recommend crazy expensive brand names, mine cost me the equivalent of 5 dollars from Ikea and has a probe that goes in the meat in the oven and the unit beeps when the meat reaches the desired temp. I’ve never tried making my own curry paste! Definitely plan on giving it a go along with this recipe as my husband was just telling me the other day he’d like to cook duck sometime soon. Great idea on freezing the curry cubes. I’ll have to try that! I need to try cooking duck soon — this looks so tasty!! Thanks Whitney, freezing the cubes is genius (even if my wife argues that just because the technique is genius it does not mean I am)… I use lots of curry pastes however I usually have ‘fresh’ ingredients for them as they are less seasonal, but the basil and lemon grass are a little tougher for me to get my hands on so it is the perfect solution. This really tasty Brian! 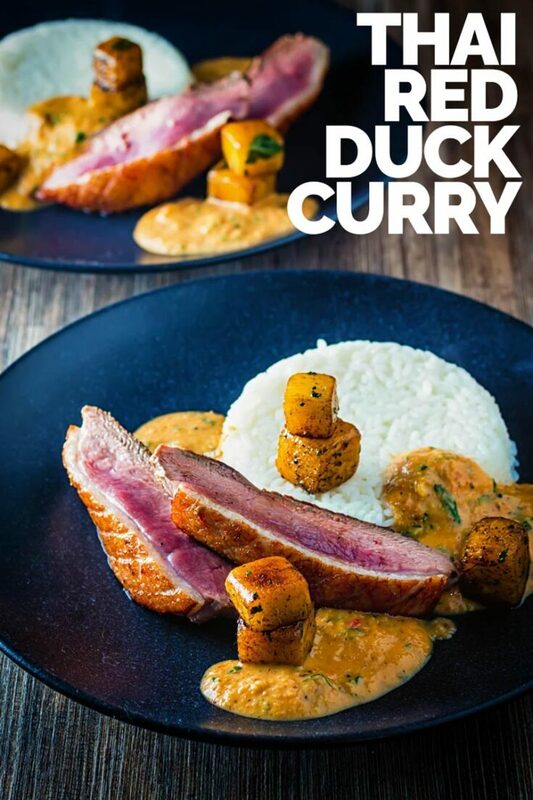 I’ve not ever tried duck before 🙂 But I do love Thai red curry paste…and your combination with pineapple and coconut milk sounds amazing! Paige this is wonderful and keeping it all separate alows things to be cooked to perfection which I often find difficult in some curry/casserole type dishes.